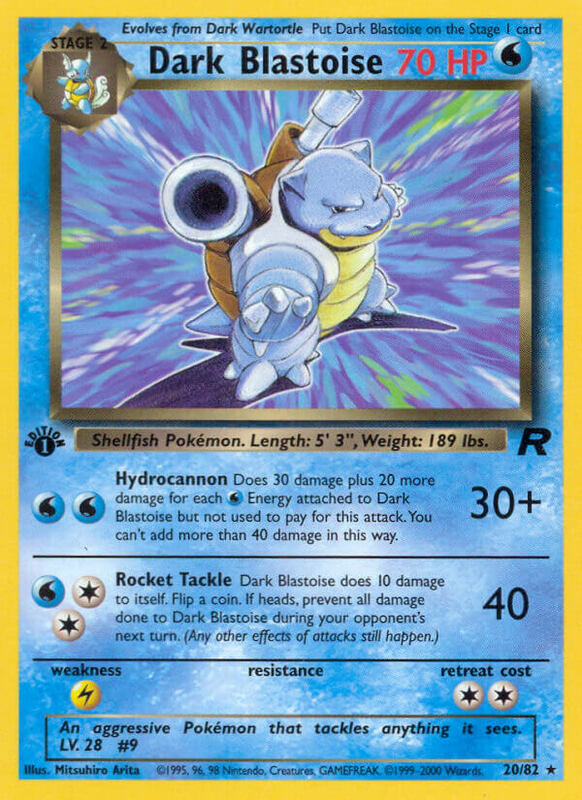 Does 30 damage plus 20 more damage for each [W] Energy attached to Dark Blastoise but not used to pay for this attack. You can’t add more than 40 damage in this way. I love the flavor text. I didn’t think a Lv. 28 Blastoise was possible. I believe the in-universe explanation behind Dark Pokemon is that they’re a Team Rocket experiment. Think Red Gyarados prototypes. Oh yes, I didn’t put that into consideration. Kinda like the clones Mewtwo made in the first film. And why Nidoqueen can breed and makes baby Nidoqueen the Mewtwo Special. That’s why all of them have less HP than their standard versions. 70 is better than 50 or 60.